Today we are going to be looking closely at Ecovacs’ current top-of-the-line model in their OZMO line of robot vacuum cleaners. Sporting a proprietary smart navigation system, adaptive floor sensing, and support for Google Assistant and Amazon Alexa, do the extra features justify the extra cost? In a word, yes. As we detail below, the DEEBOT OZMO 930 provides a solid cleaning experience while mixing in smart home features that people have started to expect from their electronics. While not perfect (by any stretch), the DEEBOT OZMO 930 is an easy purchase for anyone looking to offload the tedious task of keeping up with dust bunnies and pet hair most households are familiar with. The smart home features are welcome additions that add quality of life improvements over more economical options in the robot vacuum market. In addition to the expected vacuum unit and charging station, Ecovacs includes the option of carpet and hard floor suction attachments, a mopping attachment with two (2) mopping pads, and two (2) sets each of the air filters rotating brushes for loose debris. Ecovacs provides a quickstart guide that walks you pretty seamlessly through the initial setup to prepare you for the initial mapping of your home that unlocks most of the cool smart home features of the OZMO 930. Basically, you plug in the charging/docking station to a wall outlet, assemble the vacuum with the appropriate accessories for your floors, place it on the charger for its initial charge (about 4 hours) and switch it on. Once the OZMO 930 is charged, simply press the auto-clean button and the vacuum will begin its initial cleaning. As it makes its way around your home for the first time, While it conducts its initial cleaning, the OZMO 930 also scans and maps your home using its Laser Distance Sensor located in the circular disk on top of the unit. After mapping your home, simply push the auto clean button on the OZMO 930 any time you want it to clean the home and away it goes. The OZMO 930 can be used without ever utilizing the smart home features available to users, and I imagine less technically inclined folks may never get around to them. However, the additional functionality is significant enough to discuss here. The OZMO 930 has a few standout features to help it stand out from the crowded robot vacuum market. The first and most noticeable feature is the built-in mopping function. 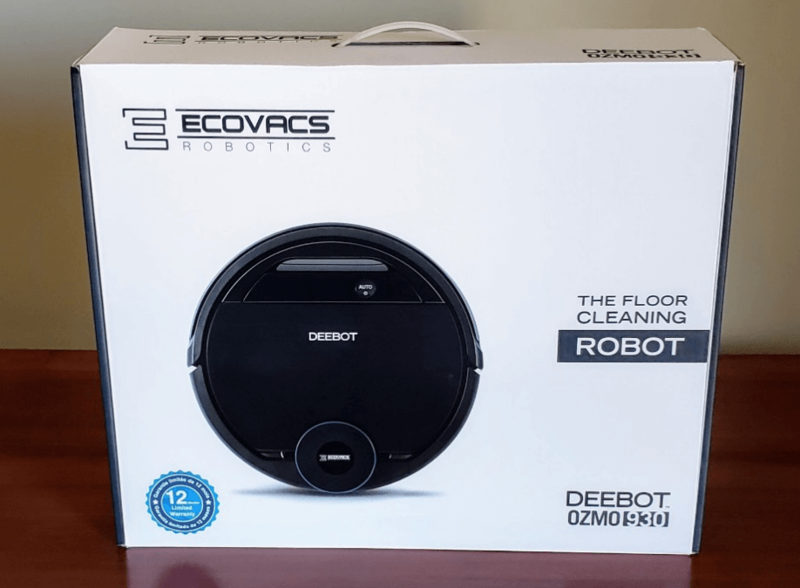 While other brands like iRobot have opted for separate mopping and vacuuming devices in its product line, Ecovacs offers the OZMO 930 as an all-in-one unit designed to work intelligently to transition seamlessly between hard floors and carpet. As detailed below, it mostly succeeds in this regard. Another feature touted by Ecovacs on the OZMO 930 is its Smart Navi 3.0 mapping technology, which maps the floor plan of your home in real time, which, after complete, allows granular control of when and where your OZMO 930 cleans. Finally, Ecovacs has included a carpet detection technology, which boosts suction strength on the vacuum when it moves from hard floors to carpet, and avoids carpet all together when the mopping attachment is present. Every home appliance and device has seemingly been given the “smart” treatment, and vacuums are no different. However, in this instance, the smart home features added by Ecovacs provides some meaningful features available only after you connect the OZMO 930 to your home wifi network. To do so, you first need to download the Ecovacs app from the Google Play Store or Apple App Store and launch it on your mobile device. You are then asked to create an Ecovacs account and then sent through the process of connecting your Ecovacs vacuum to your wifi network. Candidly, I had a difficult time getting the OZMO 930 to connect to my home wifi network. The app does a good job letting you know that the OZMO 930 does not support 5ghz networks, but I didn’t anticipate any problem as my home network supports both 2.4 and 5ghz bands. As it turns out, in my case, having 5ghz radios active on your network at all creates issues with the OZMO 930. It wasn’t until I manually turned off the 5ghz radios for the network I wanted to connect to did the device finally play nice and report as connected. In 2019, it seems a little silly to have issues like this crop up with network technology that has been around for nearly ten years. Once you do get your app up and running, you can view the scanned map of your home as created by the OZMO 930 on its initial run and most usefully, allow you to send the vacuum to only certain areas of home that may need a touch-up by either selecting a “zone” that the OZMO 930 assigns to various rooms in your home or drawing a square around a more specific area that may have suffered a spill, etc.. I found this feature particularly useful. I have included a picture of the map created of my main floor by the OZMO 930, which turned out pretty well. Depending on whether and which home assistant devices you have scattered around your house, Ecovacs has you covered with built-in support for both Amazon Alexa and Google Assistant. Simply search for Ecovacs in the Amazon Alexa or Google Home apps and link your previously created Ecovacs account. From there, simply ask Alexa or Google to “tell DEEBOT to start cleaning.” It works as advertised, and for those of use who interact with our personal assistants every day anyways, makes it easy to get the OZMO 930 cleaning without walking over to it and manually pushing the start button. So, everything I’ve written about above is all well and good, but how does it actually perform? Very well, as it turns out. Surprisingly, despite the fact that I am a tech junkie, I have never owned a robot vacuum. But, having used the OZMO 930 for a couple weeks now, I can already tell that I will never live without a robot vacuum again. In my house, the entire bottom floor is covered in hardwoods, which means that dust bunnies and bits of debris accumulate on a daily basis. This means that before now, I would either break out the broom and dustpan or the vacuum every few days, or allow the home to slowly be taken over by the dust and dirt caused by a household full of children and dogs. Enter the OZMO 930, which my kids have endearingly dubbed “Mr. Clean.” Every few nights or so, and after the kids go to bed, we simply summon Mr. Clean by telling Alexa to tell Deebot to clean the house. By the time we go to bed, every corner of our home on the first level has been scoured and cleaned. It works remarkably well. The OZMO 930 is not without its faults. For example, this vacuum like most (all? ), is not great about dealing with certain area rugs. In particular, our great room as a large rug with thick tassels that the OZMO 930 always seems to get caught on. Unfortunately, this a mostly unavoidable problem, especially when (as in my case), the tassels cannot be effectively tucked under the rug during cleaning. In addition, I made the mistake of running the OZMO 930 on my ground floor with the carpet vacuum attachment (which is exclusively hardwood) because that is what is installed by default in the box. The result was a pretty tattered carpet vacuum attachment. I replaced it with the hardwood/tile attachment, which works fine. At $599.99 MSRP, the OZMO 930 is certainly not an entry level robot vacuum. However, with advanced features such as mapping, smart home integration, and mopping, Ecovacs does offer a compelling package for the price, assuming you can pick it up for the regular sale price of about $450.00, which puts it in line with other competing options in the market, very few of which offer vacuum and mopping features in one unit.